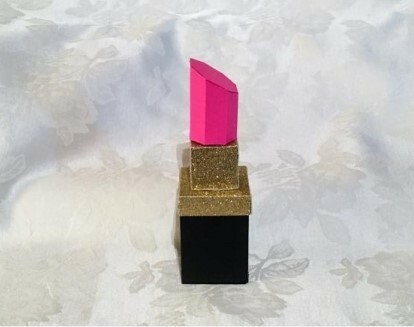 We know your guests will be impressed when you set out our Lipstick Favor Boxes! 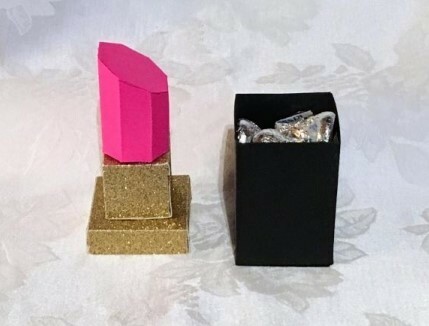 Perfect for a Lipstick party theme, our boxes measure 5 3/8" tall x 1.5" x 1.5" from top to bottom. The bottom portion is 2.25" tall x 1.5 x 1.5 can hold 8 to 10 Hershey ™ kisses. Made from card stock. Your lipstick collar can be gold glitter or silver glitter and your lipstick color choices are: light pink, hot pink, red, light purple or purple.